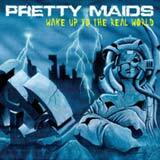 After a rather disappointing effort in Plant Panic, Pretty Maids return from a four year break with their new studio album, Wake Up To the Real World. Before I spun this album for the first time, I feared that the Danish kings of melodic hard rock would continue down the flawed path of their past album; an album that was largely devoid of hooks, melodies, and chemistry. Luckily, I am wrong in a big way. Former Royal Hunt drummer Allan Tsichaja joins the Maids for this album as they make a triumphant return to the classic, melodic power rock. It doesn’t take more than a few seconds of listening to the opening title track to realize that the classic Pretty Maids sound is back with a vengeance. Ken Hammer lays down some of the catchiest riffs I’ve heard from the band in recent years right from the start. Wake Up to the Real World is a perfect way to open the album as it’s a hard edged, but highly melodic and hook laden anthem for the listener to latch onto right away. The album has a nice balance; ranging from power AOR type of songs such as the brilliant Another Shot of Your Love to gritty, melodic metal gems such as All In the Name of Love. I Am The End is a darker, mid tempo cut successfully combines the catchy riffing, hooks, and melodies of the Maids’ sound with a dark and serious tone. Again, this is another example of the nice variety of songs in store for you on this album. As Guilty as You Are and Where True Beauty Lies are the ballads of the album. I’ve always said that power metal bands for the most part write putrid ballads (Helloween, Hammerfall, and Stratovarius are prime examples), while melodic hard bands seem to have a knack for this type of song. These two tracks further reinforce my belief, as both are excellent ballads. I’m not a huge fan of ballads, and usually skip them, but these two are very much worth their place on the album. The Pretty Maids have abandoned (thankfully) the sound of Planet Panic in favor of the Spooked through Carpe Diem era sound. Actually, this album could have easily been the logical follow up to Carpe Diem, and I think Wake Up to the Real World surpasses that effort. It’s not quite to the level of Spooked (a melodic hard rock masterpiece), but I think most listeners will be very surprised at how well this album turned out. Ronnie Atkins hasn’t lost even the slightest bit of his voice. His delivery is the perfect combination to Hammer’s riffs, with his ability to sing smooth and melodic or gritty and powerful a huge asset to the band. The keyboards fall into the Carpe Diem / Another Worth Doing mold. That is, they are subtle, helping to emphasize the melodies, not nearly as over the top and dominating as they were on the bands albums from the 1980’s. Again, the songwriting on this album is simply excellent; just as I would have expected from the band excluding their last album. The only blemish I can point out is the Deep Purple cover tune, Perfect Strangers. It’s not bad per se, but it doesn’t stand up well to the numerous gems on preceding this track. Pretty Maids are normally not a band to include cover tracks on their albums, and I do think another original Maids track would have been a better idea here. All in all, this is a highly impressive “comeback” for the Danish masters of melodic hard rock. Hopefully, the trouble that kept the band silent for four years will not resurface, and Pretty Maids will continue to release killer albums such as this steadily every 1-2 years. I would hesitate to call Wake Up To The Real World the band’s best effort, but it is near the top. As far as melodic hard rock albums for 2006, this is one of the 3 or 4 best that I’ve heard; so look for this album on my best of 2006 list in January. This album is a blind buy for fans of Pretty Maids (even those displaced by Planet Panic), and for melodic hard rock fans in general.